Fire Safety Should Not Go Unnoticed In Public Places! 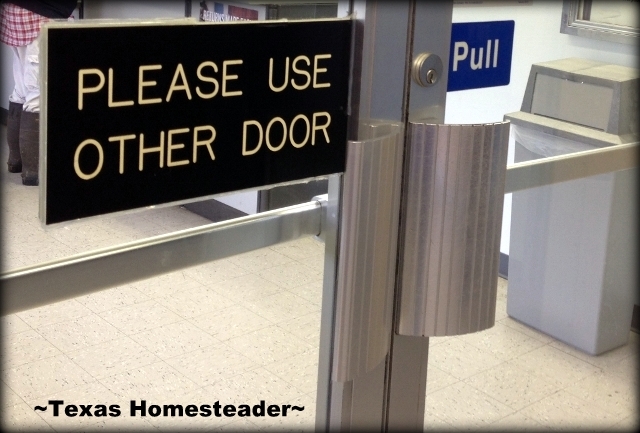 Fire Danger: Locked Doors? Blocked Exits? SAY SOMETHING!! RancherMan & I were running errands in a nearby town recently and we decided to stop for a quick bite to eat. It was raining and there were rivers of water running through the parking lot, so a close parking spot was nowhere to be found. We parked at the end of the building and made a run for the doors. As we finally reached the doors drenched from the rain, RancherMan leaned forward to open the door for me as he always does. “PLUNK“. The door was locked. Does anyone have any insight into why businesses routinely lock one of their doors & force patrons to use the other? Maybe there’s a reason? But I’m thinking if a fire broke out at this fast-food place during the busy lunch hour & all patrons rushed to the door they would be met with a locked exit door. I know what happens in a fire-panic situation where people mob to the exit only to find it locked. Yes they can try the adjoining door, but by that time they are not exiting in a straight line. Now they’re backing up, looking around, changing directions, stumbling, falling, etc. And each person that falls becomes an exit obstacle for the person behind them, and so on. Because of my long tenure in a fire-protection field I’ve had to be aware of so many tragic events at restaurants, night clubs, etc. I’ve seen way too much fire tragedy. Fire safety is in my blood. My father retired as captain of the Bethany Fire Dept after 21 years of service and he was also a photographer for the newspaper on days that he wasn’t on duty as a fireman. He had his own photo development equipment so there were always lots of fresh photographs of the action. 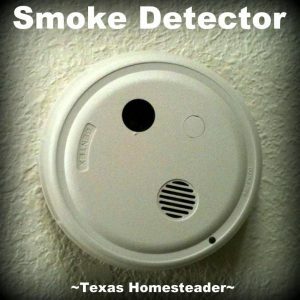 OK, once while staying in a hotel I requested RancherMan to check the smoke detector in our room. When he did the alarm went off and the fire department was automatically dialed. Although thankfully the emergency call was canceled before the firefighters actually hit their trucks, you definitely want to make management aware of your request before you test. OOPS! Carelessly Blocked Fire Exit = Potential Death Trap! And what about this! Last week we were enjoying a special celebration dinner at a very well-known restaurant. The server seated us close to the fire exit & THIS is what I saw! The fire exit was blocked by several chairs, serving trays, foldable serving tables, high chairs, etc. Typically I’ll go straight to management & ask that they remove the blockage immediately. But not wanting to embarrass our dinner guests, I instead took pictures. I forwarded them that very night to the fire marshal of that city. This awareness is all I can really hope for. BUT, if y’all see something similar in a restaurant or other public location – speak out! Awareness is key! Like the fly that insists on landing on your nose over & over again until you become irritated enough to take action, I’ve got plenty of ammunition to work with, and dammit I’ve seen the picture! I’ll be speaking with each & every manager of a business that has one of their doors locked and ask them to unlock all of their public access doors for the safety of their patrons. I’ll demand that the fire exits remain unobstructed at every public establishment I visit. And If I don’t get appropriate action I’ll contact my fire department or my County Fire Marshal’s Office and have them swing by & chat with them – I hope you’ll do the same. C’mon by & sit a spell! Come hang out at our Facebook Page. It’s like sitting in a front porch rocker with a glass of cold iced tea – lots of good folks sharing! You can also follow along on Pinterest, Twitter or Instagram. 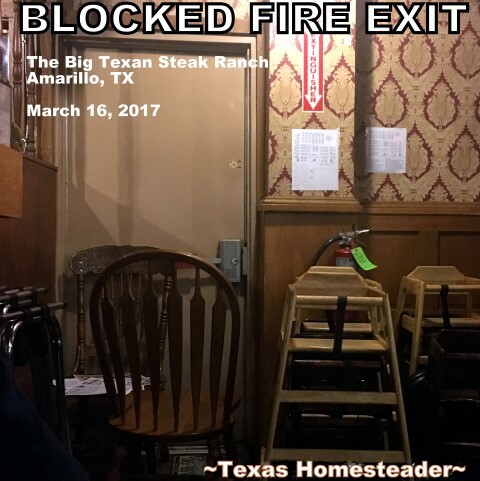 This entry was posted in Blog Posts and tagged Rants, Small Town Living on March 31, 2017 by Texas Homesteader. I complained just yesterday regarding a matter of a fire exit being locked at a restaurant. I just googled to make sure I wasn’t the only person to complain about something like a locked fire exit as the manager of the restaurant seemed completely shocked that I was not happy the door was locked! Apparently it had just broken that morning and there was nothing she could do about it and that it didn’t matter as there was a fire exit in the kitchen we could use, I explained that 1. We had no knowledge there was one in the kitchen as there were no signs showing us and 2, the fire would most probably be started in the kitchen. I explained that she should at least put a sign on the door to inform people it’s locked and where the nearest exit was, she replied ‘fine a sign, if I put a sign you will be happy, fine then’ and she walked off in a huff, 20 mins later she returned with a printed sign (that could only be read if you were stood right at the door as writing so small). She stuck it up, walked back past us, grinning at all the customers on the other side of us, ignoring us, and no other member of staff checked on us during the rest of our time there, even though they checked on all tables around us. I myself am too a shy person and for most thinks I get embarrassed if I’m with someone that complains but for something like a locked fire door I couldn’t stay quiet. I am health and safety officer at my work. Thank you for your post and making me realise I was completely in my right to complain about a locked fire exit. Thank you for sharing your concern so passionately. You totally got my attention. We here in the Bay Area are still reeling from the Ghost Ship fire that took so many lives, and another in the same city just this week that claimed four more. Both deadly fires occurred in structures with years and years of fire safety violations. Like you, I am shy, but I will speak up if I see fire escape routes blocked. Thank you again for your impassioned plea. This has never occurred to me! Thank you for this post; I will start paying attention and follow your example. Blessings to you! My own office has a history of bad fire safety practices. We’ve failed our fire inspections numerous times for storage rooms full of paper so high that the sprinklers were blocked. As an emergency first responder volunteer I have heard enough and seen enough to be “paranoid” but I am always met with rolled eyes and apathy. I sometimes wish that fire safety courses involved the controlled fire situations fire-fighters face in their training. Let people see what it is like to be in these situations with trained professionals on hand in case of injury. Maybe then more people would worry before it is too late. I have seen the same thing, and though I have mentioned it, I need to do better. One of my sons worked at a place where they actually unloaded large heavy pallets right in front of the fire escape… he took the time and moved all of it on his own because of the danger. Thank you for this post… I will be sharing it.